After an evening at Ten Bells in the Lower East Side, where I started with a glass of Briseau 2005 Kharakter (off dry, dark yellow, pear drops, almonds, great acidity) and subsequently split a bottle of Agnès et René Mosse 2007 Anjou Blanc Bonnes Blanches (young, tight, decanted, opened up nicely, good), I realized I had omitted to enjoy any of the lovely sounding food offerings. I had thoughts of picking up some pizza, but decided to make do with what I had in the fridge, freezer, and pantry. I made a very simple, tasty, and reasonably healthy pasta dish. Cook the pasta in boiling salted water. Defrost the veggie patty in the microwave and chop into small pieces. In a skillet over medium high heat, add olive oil, the de-frosted veggie patty and the frozen peas. Season with salt and pepper. After a couple of minutes, add the cooked pasta, with a little pasta water. Grate some cheeses (fontina and parmiggiano) onto the mixture and toss. If the pasta is a little tight, add some more pasta water. Check for seasoning. Toss in the breadcrumbs and the parsely. Serve. It would have even better with some red pepper flakes to add a little kick, but the fontina cheese gave it some depth, the veggie patty some "meat", and the parsley some freshness. 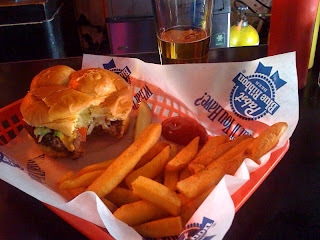 I visited a friend in Atlanta this past weekend and we found this great PBR burger joint in the Highland's. On a Saturday, Moe's and Joe's Tavern is exactly what we were looking for - good, cheap eats in an authentic atmosphere. We both ordered the half pound Angus burger which was served with fries in a plastic tray. The burgers were well cooked (although we were not asked how we wanted them cooked) and served on a soft bun with lettuce, tomato, mayonnaise. Add a little ketchup and mustard and you are off to the races. 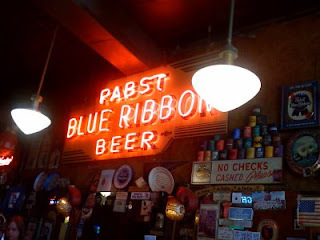 Since we were in a PBR bar, I went for a pint of PBR. Really, it would have been rude of me not to. My friend had a pint of Sweetwater 420 Extra Pale Ale - a local brew that is excellent. It may have been that I was still slightly recovering from the night before, but it was a perfect lunch. Another purchase from the Lobster Place in Chelsea Market - this time Mackerel and fresh (not frozen) Florida Shrimp. Pan seared Mackerel and Shrimp (shell on) with white wine, lemon juice, fresh parsley, with a side dish of roasted cauliflower with cayenne and mild curry powder. The cauliflower florets were roasted for about 20 minutes in a 425 degree oven in a roasting pan after being tossed in olive oil, seasoned with salt and pepper, and dusted with cayenne and mild curry powder. 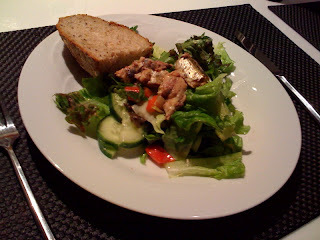 The mackerel was seasoned simply with salt and pepper and seared in a saute pan in olive oil. When they were cooked to my liking (a few minutes a side), they were removed and the shrimp was added to the pan. 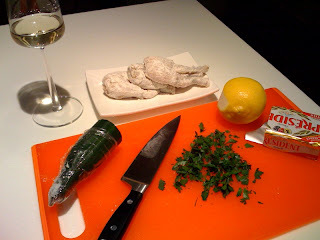 After turning, I poured in some white wine (happened to be white burgundy) and squeezed in some fresh lemon juice. At the end, fresh chopped flat leaf parsley was added. The pan sauce was poured over the shrimp and the mackerel. I paired this with an inexpensive Portuguese Vinho Verde from Muralhas - a wonderful pairing - the brightness and crispness was a great foil to the roasted cauliflower. A pure, clean, simple meal. Another fish purchased at the Lobster Place in Chelsea Market. They have an excellent selection and their fish is fresh. They clean the whole fish and all I had to do was stuff it with fresh parsley, fresh dill, and lemon slices. Sprinkle both sides of the fish with olive oil and season with salt and pepper. In a pre-heated 425 degree oven cook the fish for about 20 to 25 minutes (or until the fish is the appropriate doneness for your liking). The Dorade has a white flesh with a lovely rich, meaty flavor. I served this with simple steamed broccoli and sauteed spinach and garlic. 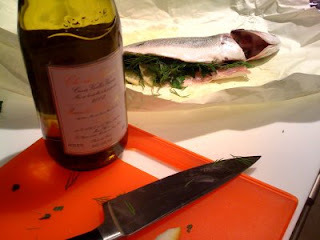 For wine, this was paired with the Domaine de la Pepiere (Marc Olivier) 2005 Muscadet. I actually think the meal should have been paired with a weightier white - perhaps even a chardonnay. While shopping for fish at The Lobster Place in Chelsea Market, I stumbled upon frozen frog's legs - what a find. 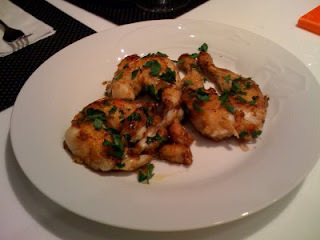 I had never cooked frog's legs, but have devoured them in many a french restaurant. Most recipes I found called for breading and deep frying, but I found one for sauteing. Soak the frog's legs in milk (I used 2% milk) for about an hour. Remove the legs from the milk. Season them with salt and pepper and dredge in seasoned flour (salt, pepper, cayenne). Add butter to a saute pan over medium high heat and add the legs when the butter has melted. Brown the legs on both sides, reduce the heat, and cook until cooked through. Sprinkle with chopped fresh parsley and serve. The meat was tenderest on one of the smaller legs, which means it was probably cooked through more than the other legs. The meat is sometimes described to be like chicken, but to me it is a cross between chicken and monk fish. 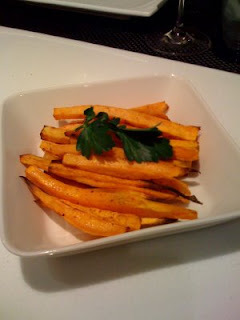 This is a wonderful and easy appetizer. I opened a bottle of Domaine de la Pepiere (Marc Ollivier) 2005 Muscadet. This is a more mellow and subtle Muscadet - it still has the minerals and citrus, but it is more mellow and rounded than the recent 2007 vintage. 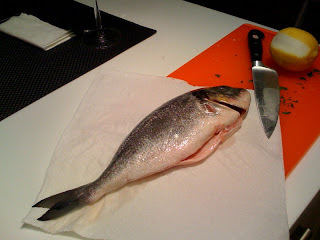 Dinner: whole Branzino from the Lobster Place at Chelsea Market stuffed with fresh parsley, fresh dill, and lemon slices with boiled small Yukon Gold potatoes (with parsley, President butter, white truffle salt), and frozen peas. 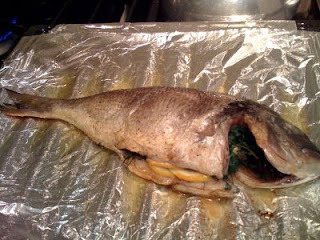 The Branzino was cooked in a 450 degree oven for about 15 to 20 minutes. The potatoes were boiled for about 10 to 15 minutes, the water was removed, and the butter and parsley were added to the pan with white truffle salt added at the end. The frozen peas were cooked in boiling water for up to 5 minutes. 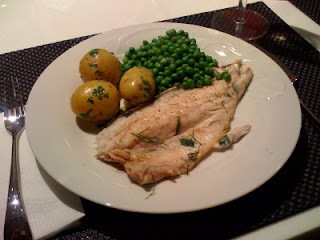 The fish ended up being perfectly cooked, tender, succulent, with delicious hints of lemon and herbs. 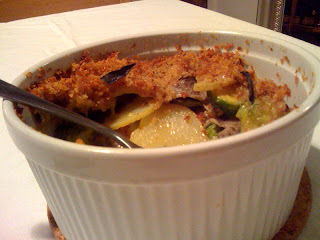 The wine was a perfect pairing for the dinner: minerally, almost briney, lemony, and crisp. All around a great meal. I recently participated in Burgerpalooza NYC with the team from The Burger Joint in DC. I missed the first three stops (Shake Shack Union Square, Burger, and City Burger), but hit the last four: 5 Napkin Burger, The Spotted Pig, Pop Burger, The Burger Joint at Le Parker Meridien. The favorites were the Lamb Kofta Burger and the Original 5 Napkin Burger. The lamb burger had mint in it resulting in a fresh tasting, juicy burger. The toppings were successfully incorporated to create a perfectly balanced burger. The Original 5 Napkin Burger is fantastic also - juicy, meaty, cheesy, oniony, all in unison. The Italian Turkey Burger was a success - very juicy and succulent, not what you normally get with a turkey burger - was it really turkey (chicken?) - how do they keep a thick turkey burger moist? The Ahi Tuna Burger was a disappointment; it sounds great, but was frankly just boring. The Veggie Burger did not hold together and the pickled onions on top were too much. The french fries were wonderful - perfectly cooked and seasoned - and for me the perfect size: classic french sized french fries. One final note: the appetizer of deep fried pickles and pastrami with sauerkraut and mustard oil is definitely worth trying. It is a great snack and mouth watering way to start what will undoubtedly be an unhealthy meal. 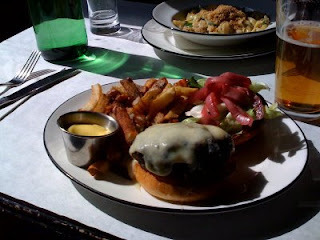 When I think of The Spotted Pig, I do not think of sitting at the bar at 2pm on a Thursday, drinking a glass of water, and sharing one burger with five other people. But we were on a burger tour and managing your food intake was important. 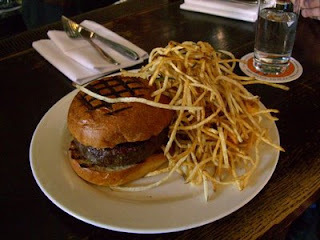 The Chargrilled Burger with Roquefort Cheese & Shoestrings was outstanding in nearly all ways. I have found when I order burgers or steaks with blue cheese on top that I really enjoy it for about half the portion and then regret the decision. I love the piquancy that Roquefort brings to a classic frizee and lardon salad, but on a burger, the saltiness is too much. The bun was toasted and the burger was grilled to perfection. The shoe string fries have some fresh rosemary added, which imparts a lovely subtle flavor enhancement. They are very tasty, but personally I prefer slightly larger sized fries. One of my companions noted - "I feel less guilty eating shoe string french fries though." The design of Pop Burger is very well done: funky Basquiat lithographs on the walls, old school flooring, clever packaging for the burger two pack. Unfortunately, the burger did not live up to the design hype. The two small burgers are well portioned for one person, but they are cooked too well done. They are basically dry little burger pucks with minimal flavor. A couple of the group had been there before and experienced the same level quality, so unfortunately, I do not think this is a one off problem. Hidden behind a curtain, down a small corridor, just beyond the concierge desk at Le Parker Meridien in midtown resides The Burger Joint. The decor is classic old style joint found in any college town in the country - and it works really well juxtaposed against the high design of the hotel. The chocolate milkshake was spot on: thick, creamy, perfect. The lemonade is not tart enough, making it taste almost flat and overly sweet. The burgers and fries were under seasoned, or possibly unseasoned. I think if this had been my first burger of the day and I was hungry, it would have received the more positive reviews that people tend to give this joint. The bun on which the burger is served is a basic grocery store bun though. Maybe I just needed about four beers in me and I would have loved the food - because I really like the decor and style. 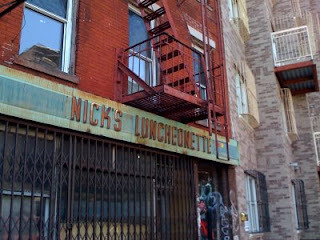 New York classic, packed, busy, efficient, inspiring, delicious, mouth-watering. 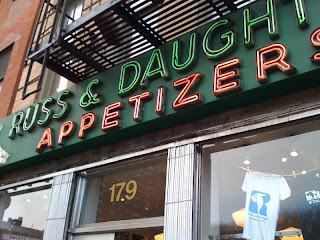 I visited Russ & Daughters on Sunday morning to pick up some brunch items (Holland herring, pickled herring with onions in cream sauce, bagels, sable). The line was long and the place looked packed. Pick up a numbered ticket and wait your turn. The short wait gives you the chance to figure out what you want, which isn't that easy. You will also have the time to take in the whole experience and while you do, you realize the people that work there know what they are doing - and they do it with love and efficiency. I cannot believe this was my first visit to this New York staple, but I know I will be back very soon. Incidentally, the Holland herring served just plain was amazing. If you have the right ingredients in the refrigerator and freezer, it is fun making an impromptu, but ever so tasty pasta dish. After visiting Russ and Daughters on Sunday morning to pick up fixings for brunch (see next post), I had some left over smoked salmon. 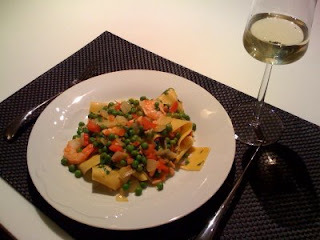 I also had fresh lasagna noodles (frozen), onion, tomato, frozen cooked shrimp, frozen peas, lemon, and flat leaf parsley. The only items that really needed cooking were the onion and the pasta, everything else just needs heating through. Add the onion to a saute pan with olive oil over medium heat, season, and cook until tender. Add the chopped tomato, combine, and cook for about a minute. Add the peas and then the shrimp. Add the cut up pasta to a large pot of salted boiling water. At the last minute add the smoked salmon, a squeeze of lemon, and a splash of white wine (if you have on hand, otherwise don't worry). Check for seasoning. Add the pasta to the pan - if there is no liquid in the pan, add a little pasta water. Toss, add the parsley, and a drizzle of good peppery olive oil. Toss again, check seasoning, plate, and enjoy with the a crisp, lean, minerally white wine. 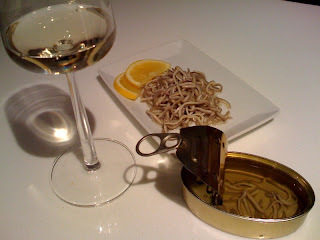 I had a couple of glasses of Aforado 2007 Rias Baixas Albarino. Tested out another can of sardines - this time the sardines were from Portugal in olive oil. Packed three to a can, the sardines were mellow and subtle. Pretty good, but did not meet the level of excellence of Matiz. The salad was lettuce, cucumber, red pepper with a mustard vinaigrette. A tasty little healthy lunch. 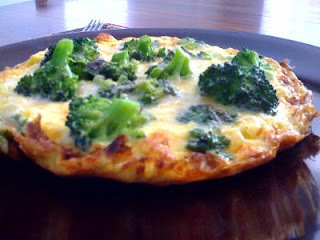 Slim pickings in the refridgerator and lunch time.... broccoli, onion, cilantro, cheddar cheese, parmigiano-reggiano cheese frittata. Turned out really well, delicious. Turn oven broiler on. Heat a small amount of olive oil in a small frying pan (non-stick ideally) over medium heat. Add onion and red pepper flakes and stir for a few minutes. In a bowl quickly beat the eggs with a small amount of 2% milk; add salt and pepper. Add egg mixture to the pan and stir around - "pulling" down the mixture from the side of the pan. When the eggs start to set, add the steamed broccoli florets, fresh cilantro leaves, grated cheddar cheese, and grated parmigiano-reggiano cheese. Move the pan to the oven and wait a few minutes. Check on the pan - when the cheese melts and the top of the frittata starts to bubble and brown, it is done. Since I cook at home a lot, I enjoy flipping through the Williams-Sonoma catalog. I rarely buy anything or for that matter even try the recipes - although the pictures can be enticing. I was intrigued by the one pot recipe for Chicken with Saffron Rice in the most recent catalog (also available on their website). I basically followed the recipe except that I omitted the olives. 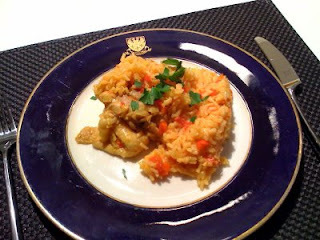 The chicken legs were moist and tender; the rice was a gorgeous saffron color. The saffron not only makes the dish a lovely color to the dish, but creates an intoxicating aroma. Instinctively, I am not sure I would have paired the wine I had with the dish, but it worked well nonetheless. The Fontezoppa 2007 Verdicchio di Matelica is inexpensive ($12.99 a bottle) and tasty. It has a tropical nose with green apple, citrus, minerality, and a great brinyness.